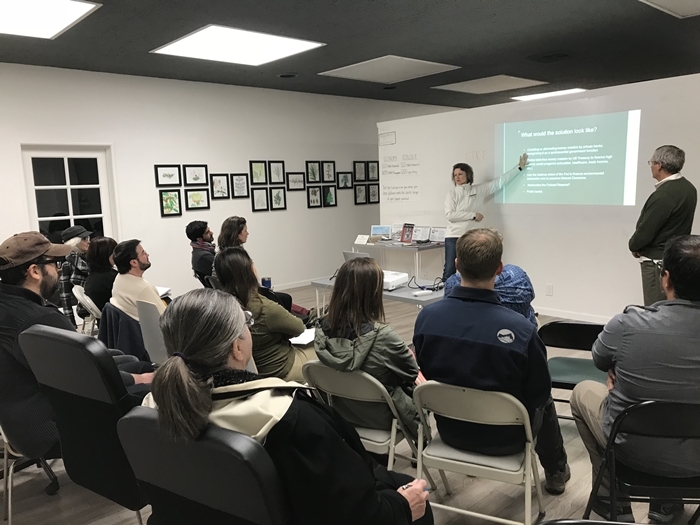 On March 7, a group of about 25 gathered at Green Hive Spaces in Vallejo for the third session of our “Next Economy” Conversations Series. From the beginning, we dived into the key issue of our current economic system: Who issues money and who decides on its use and how? Elena Karoulina and Stann Whipple presented new insights into why the current financial system is going the way it is and how we might begin to alter that course, based on concepts they learned at the recent workshop given by Marco Vangelisti through the Permaculture Institute in Santa Cruz. Our money supply has three forms: 0.03% is in coins minted by the U.S. Treasury; 25% is paper notes printed and controlled by the Federal Reserve; and the remaining “money value” is accounted for electronically through the balance sheets of major banks as members of the FDIC. Banks can lend nine times against their savings. The Federal Reserve, which is privately owned by its member banks, has no constraints as to the amounts it can add to the money supply. As the banks and the Federal Reserve are mostly privately owned, the motive to make profits for their investors influences strongly where and how their money assets are allocated. Since the middle of last century the financial sector of the “market” has received over 70% of capital investments. Historically — during the first half of the last century — there was still the understanding about earned and unearned income in the economy and how the role of the financial sector (banks and Wall Street) increased the wealth of all sectors through investments in the industrial and commercial sectors of the economy. In our evening presentation, we saw several charts depicting the change and separation of wealth in favor of the upper 5% of the population starting around 1970. Perhaps not coincidentally, the rise of neo-classical economic theories began to take precedent in the universities and financial markets around that time. The current neo-classical view makes no distinction between earned and unearned income. The classical view of the “free market” stipulated that ONLY earned income should be “traded” in the economic markets. This was a deliberate step to move away from the feudalistic system of landlords and peasants where the landed gentry exacted “payments” as owners of the land. “Free” meant that income from labor and non-monopolistic activities was “earned” and income from rents on land, monopolistic profits and interests was “unearned.” The latter was deemed a re-allocating of values — not adding new values to the wealth of the economy. This has resulted in labor, land and capital to be traded as commodities. Given this shift in defining what and how values can be recorded on the accounting balance sheets (along with corporations being accorded the same rights as “persons”), the disparity between the upper 5% and the remaining 95% will continue. The evening concluded with two presentations about recent initiatives striving to work more democratically with investment in property from Ojan Mobedshahi with the East Bay Permanent Real Estate Cooperative in Oakland and for a local food system from Paula Schnese, a founder of Cultivate Community Food Co-op here in Solano County. We can look forward to the next conversation on April 4 giving us further understanding for the economy and how to shape it to serve our local communities for the future. The funding for Sustainable Solano’s team training at the “Next Economy” course at Santa Cruz Permaculture was provided by Solano Community Foundation through their NPP Capacity Building grants program. Community conversations are made possible through a grant from the Peaceful World Foundation. Thank you to both organizations! We will continue to share insights at upcoming workshops at Green Hive Spaces in Vallejo in the coming months. Please join us at one or all of these events to further the discussion on the next economy in our community. Join us for a discussion on different strategies for a just transition to a more sustainable, equitable and just economy. Restorative economics takes a restorative justice approach to restoring and reinvesting in low-income communities of color through the establishment of community-owned and community-governed projects for self-determination and shared prosperity. Join us to discuss the design principles and strategies needed for vocation and regenerative enterprise design. We’ll discuss how we could redesign the economy for security, prosperity and a stable climate with transformation based on permaculture design principles, methods and ethics for an economy that benefits all life.